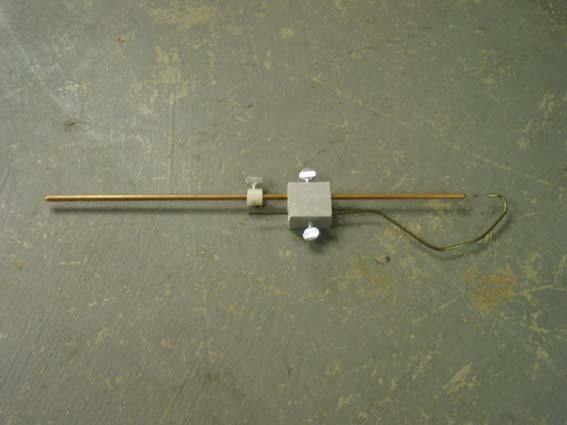 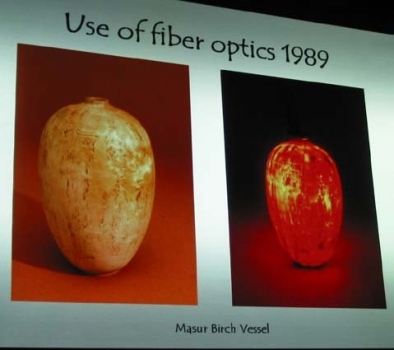 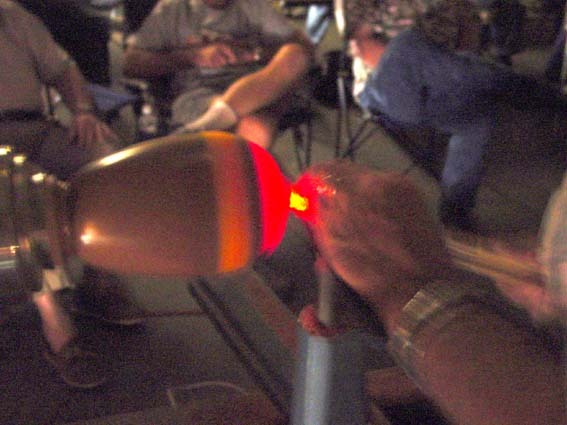 Paul uses a fiber optic light system [Industrial Fiber Optic Cables] to make the vessel thickness uniform by reaching the same intensity of light through the walls of the vessel. 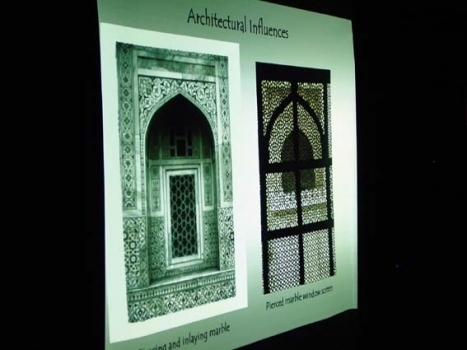 If a portion of the wall is too thick it doesn’t allow as much light to penetrate, and if it is too thin then it allows more of the light to penetrate the walls. 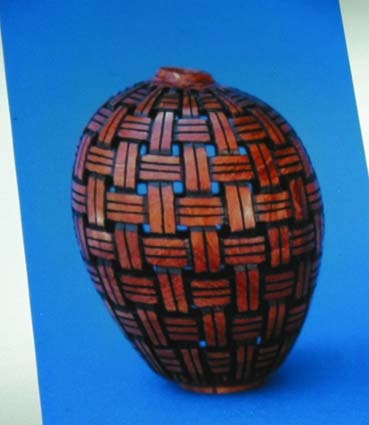 Paul noted that he works with lighter colored wood as he has not had good success with darker woods such as walnut and the fiber optic process. 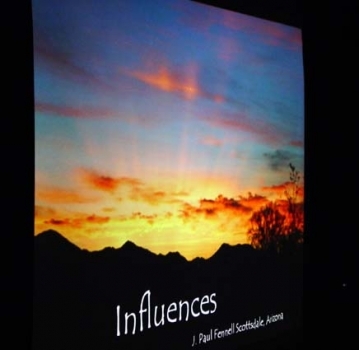 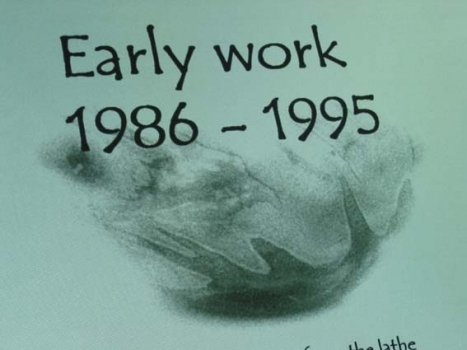 Paul began his demonstration with a slide program that showcased some his work. 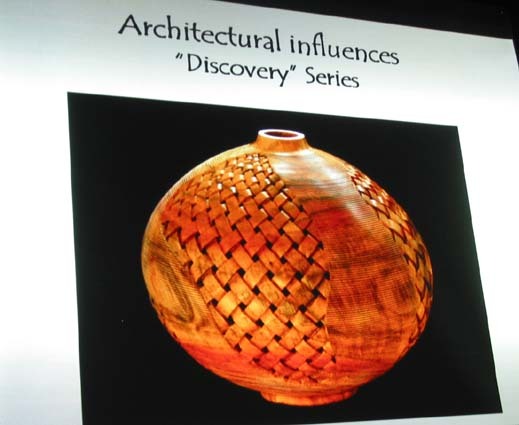 He noted that you must be observant of your surroundings to be able to come up with designs that are pleasing to you. 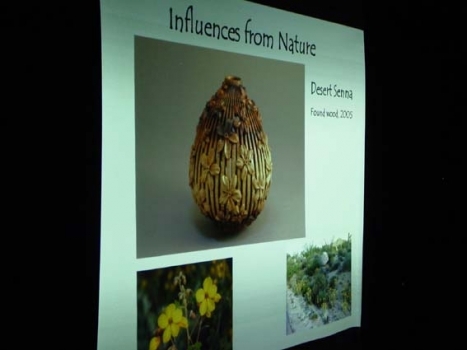 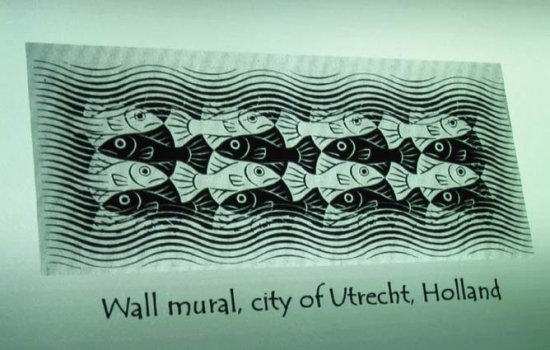 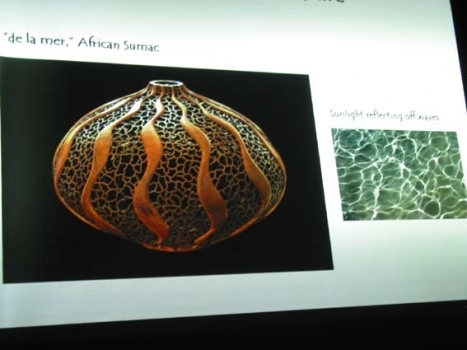 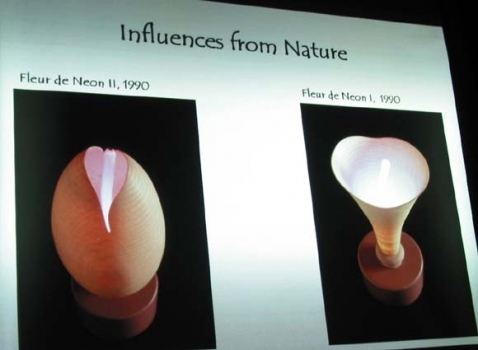 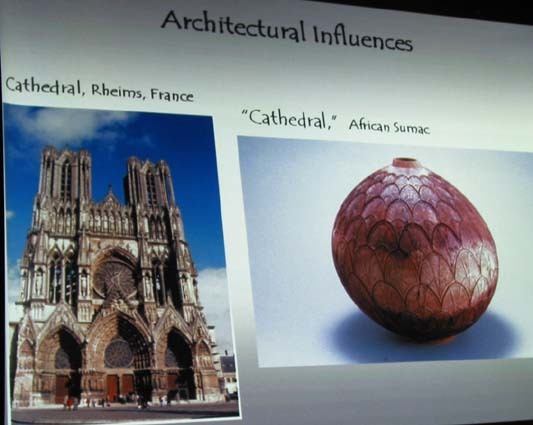 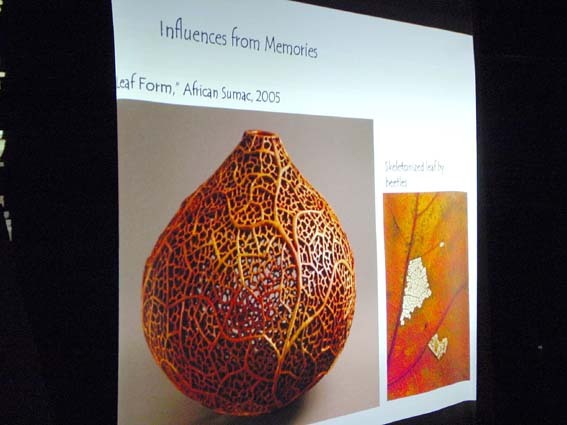 He had slides of such things as nature as well as architecture and described how he used them in developing his pieces. 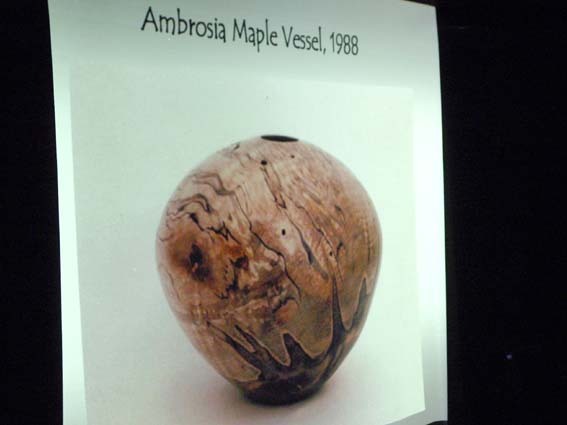 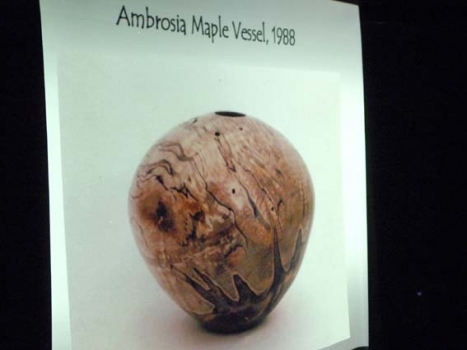 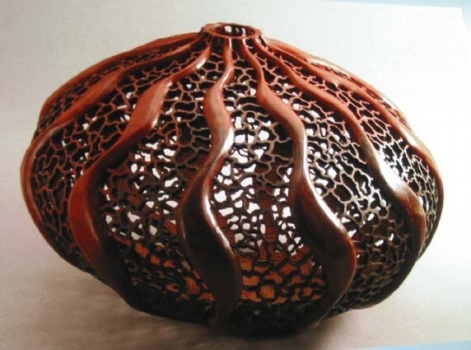 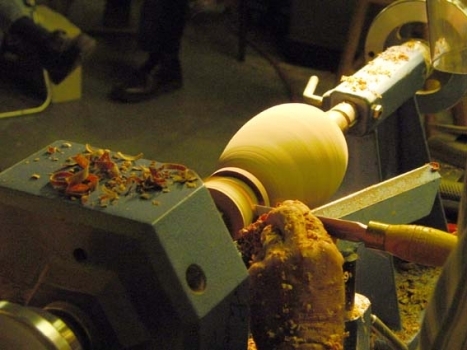 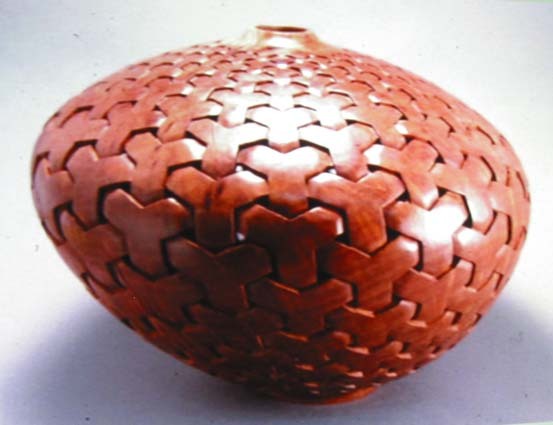 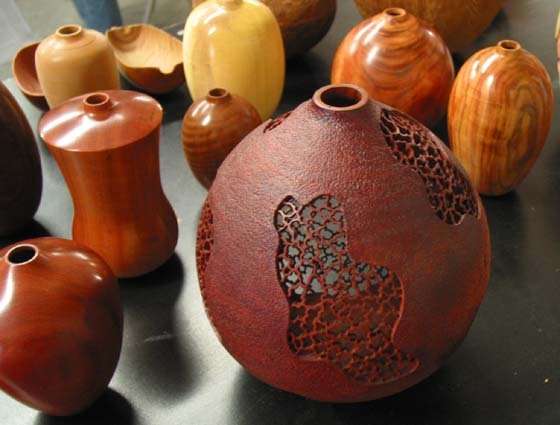 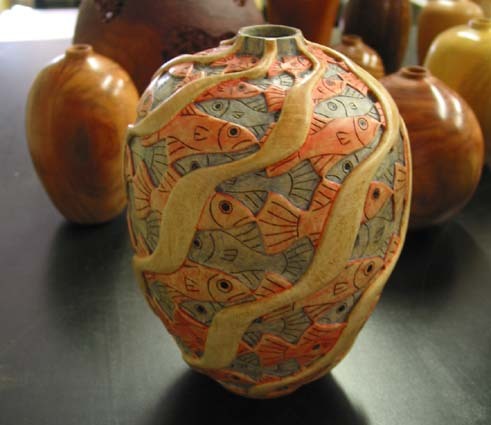 He then began a project of turning a hollow vessel from a piece of mesquite wood. 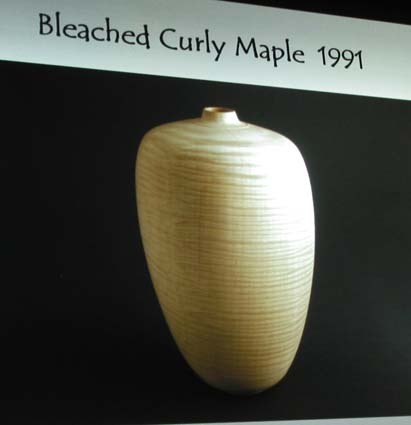 Paul stated “the right form is very subjective, you make the piece of work to be pleasing to you as you have no idea what the person in the gallery likes”. 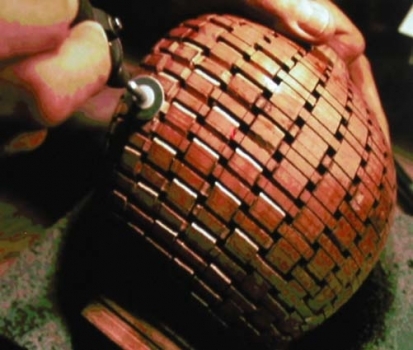 As he turned the cylinder he stopped periodically to check for imperfections in the wood. 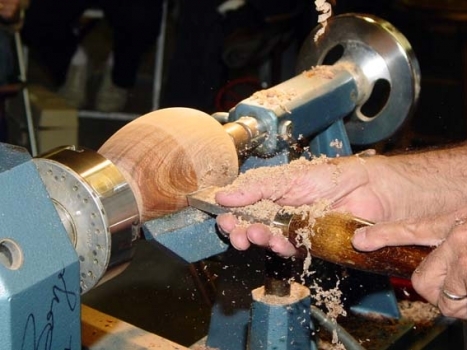 Paul noted that when placing wood in the chuck to crank it down as wood does compress and that you need to check this periodically during the turning so your piece doesn’t come loose. 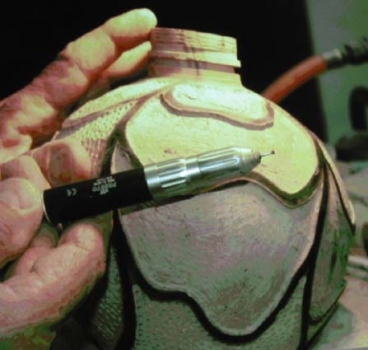 When Paul had his vessel shaped he covered the entire outside with medium thick superglue that he spreads with his finger encased in a small poly zip bag and then sets with accelerator. 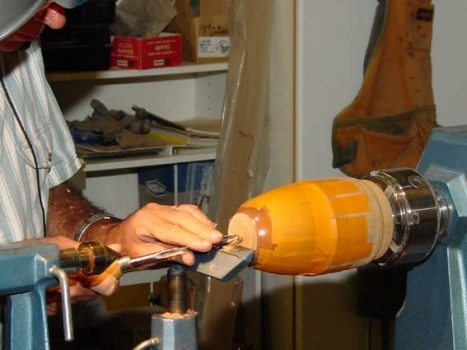 He does this so that the wood won’t dry out and change shape on him while he was hollowing in the inside. 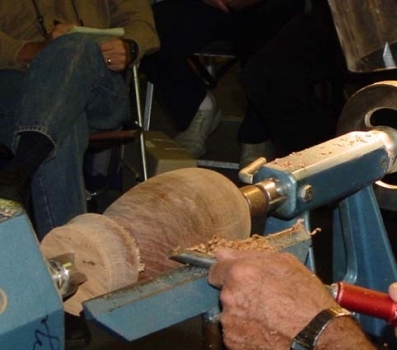 He then began the hollowing out process. 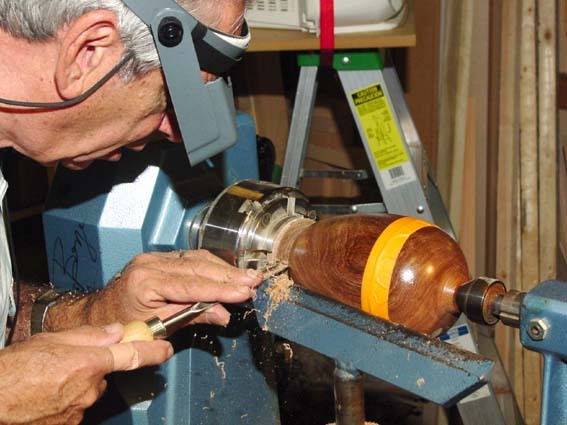 He drilled a hole in the center using a dedicated chuck and 3/8” bit. After drilling in with this, he went to a specialized fluted drill bit slightly smaller in diameter with an air hole that opens at the end. 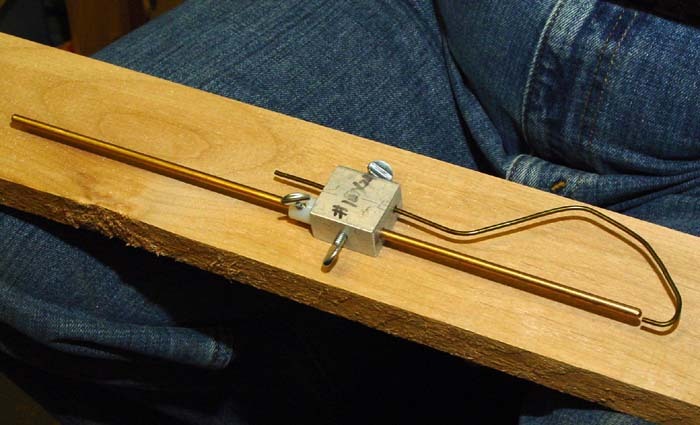 This is connected to an air compressor and is hand held to complete the drilling process. The air flowing thru the tool blows the chips out and quickly finishes the drilling process. He noted it is important to mark the drill so you don’t drill too far and ruin you work. He utilized straight tools to remove most of the bulk of the wood from the inside before he started turning the shoulders near the neck. One note is that he turns the inside in the reverse mode as he feels he has more control over the tools since the handle is toward him and can be rested against his body and it seems more comfortable to him. 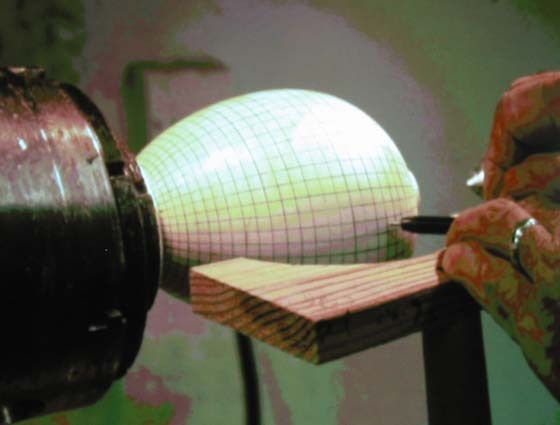 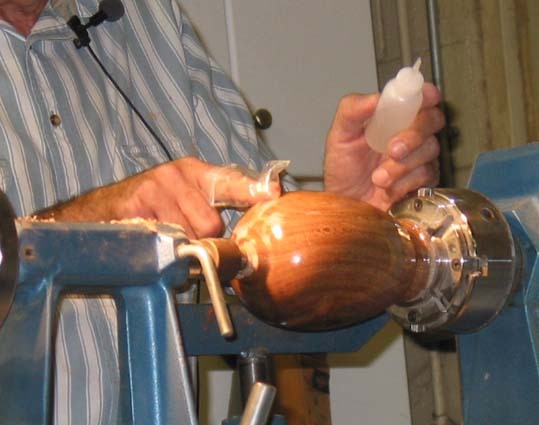 Hollowing freehand without a tool rest jig as he does, without reversing the lathe, would require the tool handle to be held over the far side of the lathe. His vessel was about 6”-7” in length and he said for that size that he takes the walls down to ¼” in thickness before he begins the fiber optic light process. 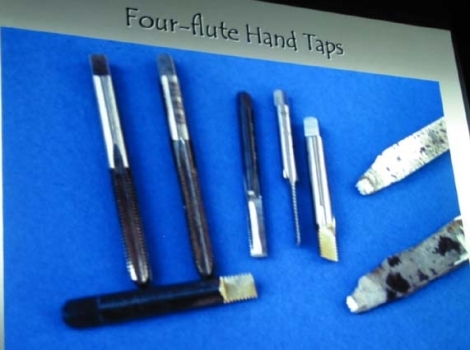 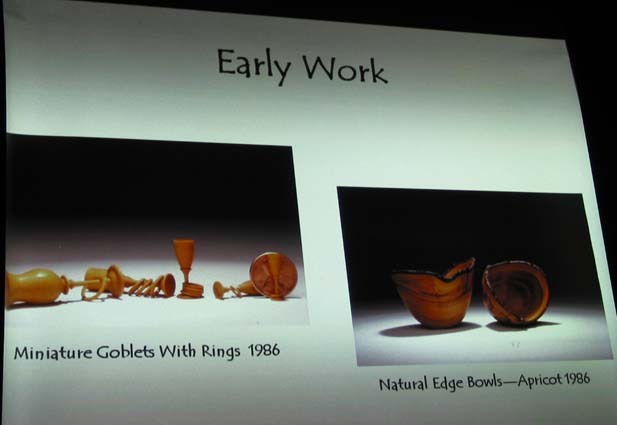 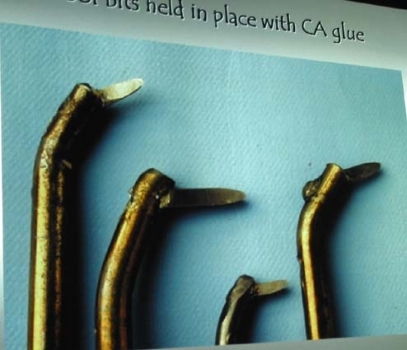 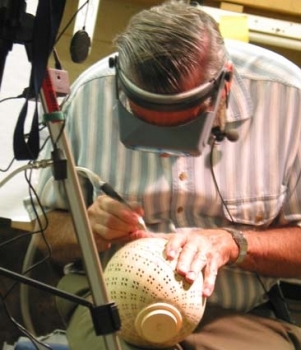 He used various handmade tools for the hollowing. 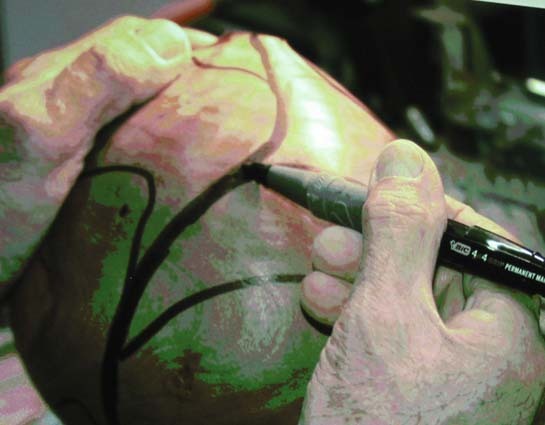 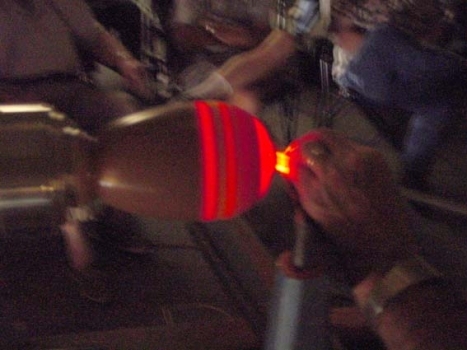 During this process he worked in the dark with the fiber optics cable held between two fingers and inserted just inside the vessel providing his light for work and to determine the proper thickness of the wall of the piece. 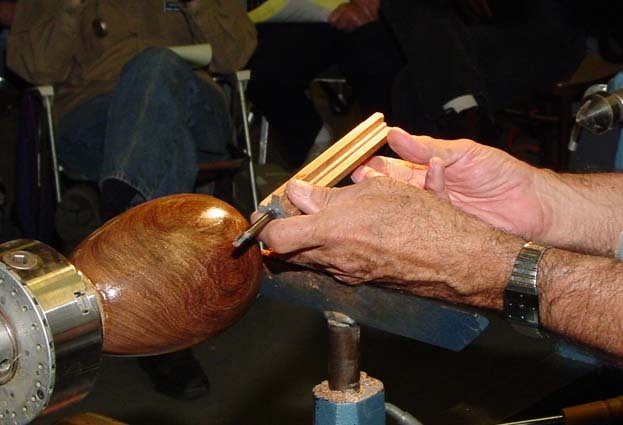 To finish off the wood he normally sands off the superglue, applies an oil finish and buffs the wood with carnauba wax. 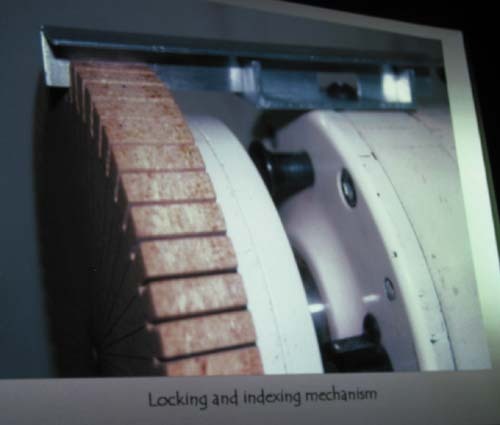 Paul also noted that 3M has begun using a color coding system that identifies stickiness of its masking tape. 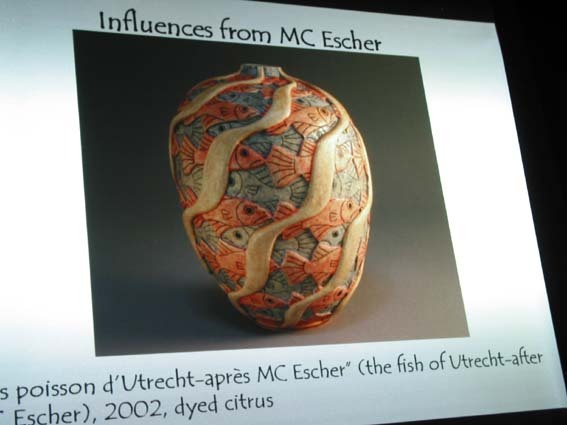 Blue is less tacky with Green very tacky and other colors such as Orange in between. He uses the tape to hold the hollowed out piece in a jam chuck while he removes the tenon and finishes the bottom. 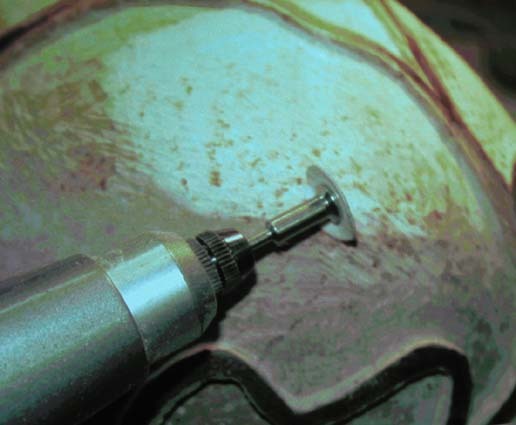 Hammered Texturing using a blunted and smoothed 16 penny nail held in a Dremel tool that has been slowed down with a variable speed device made for routers. 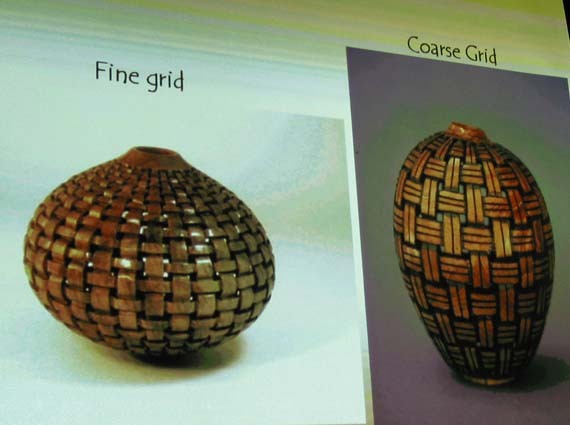 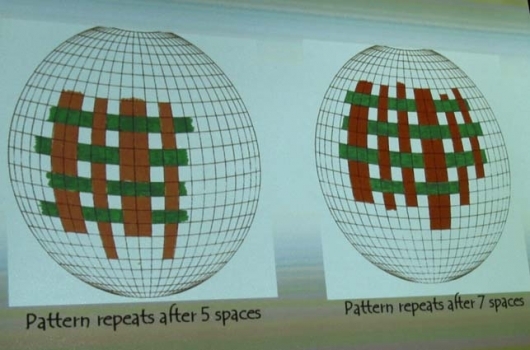 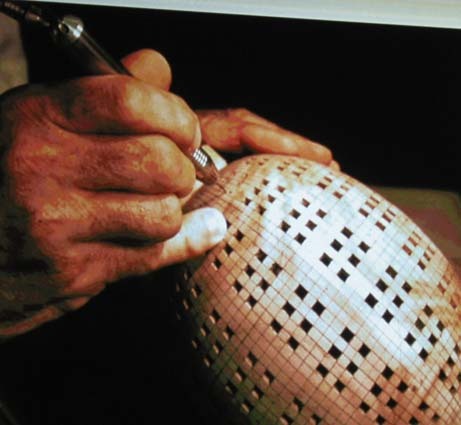 Paul demonstrated his technique for laying out a grid, with any number of divisions, to create a straight and spiral basket weave pattern. 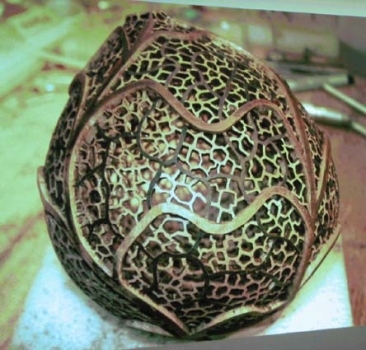 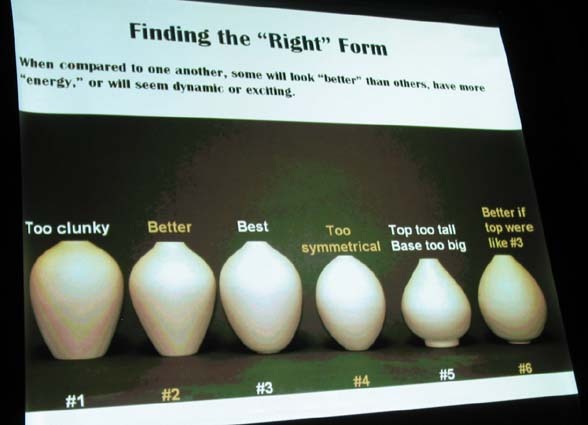 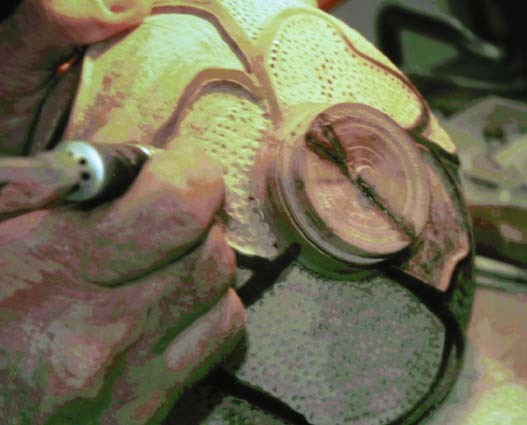 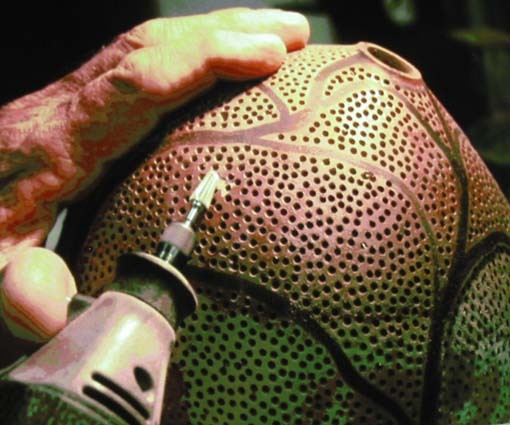 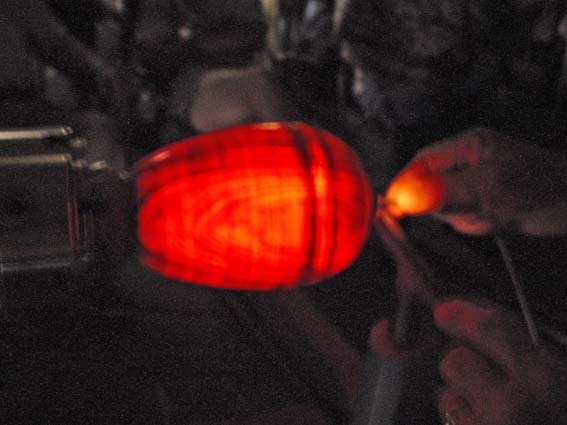 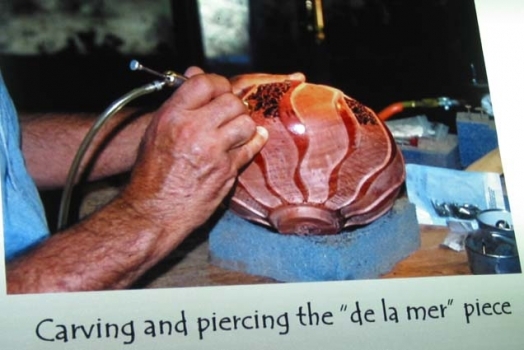 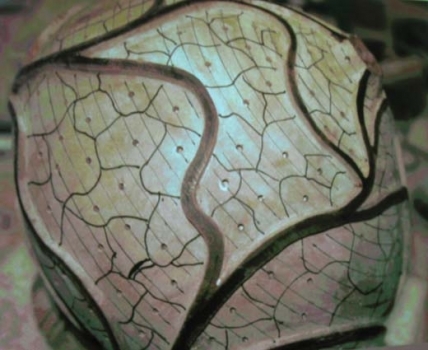 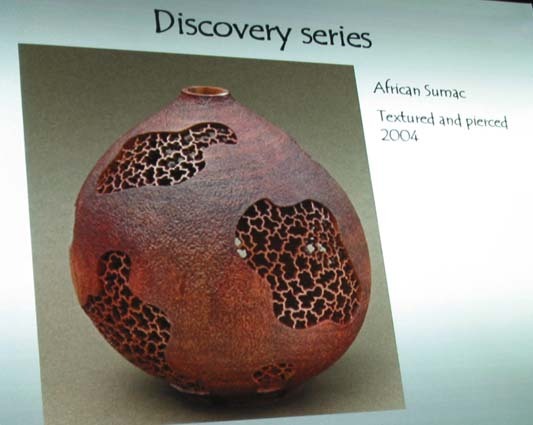 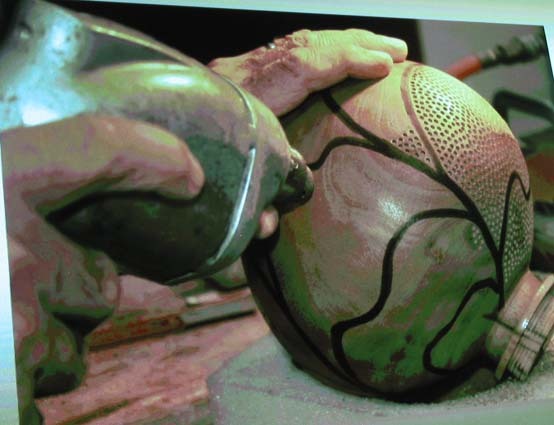 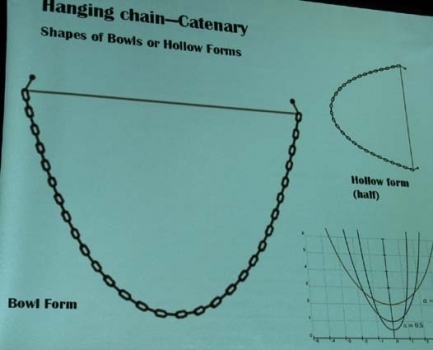 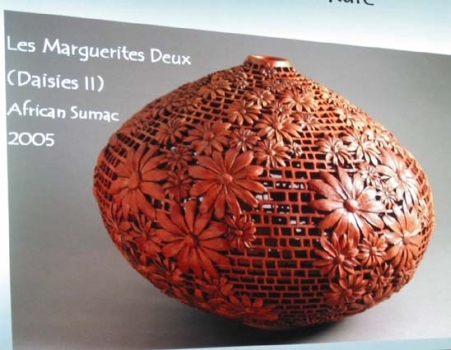 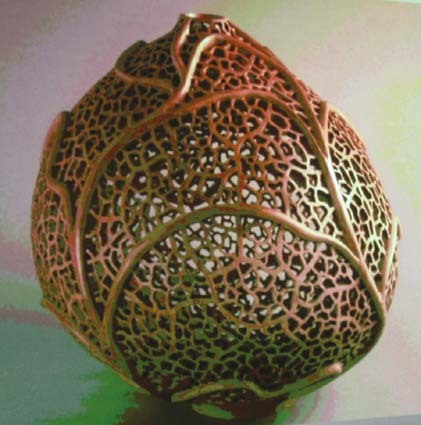 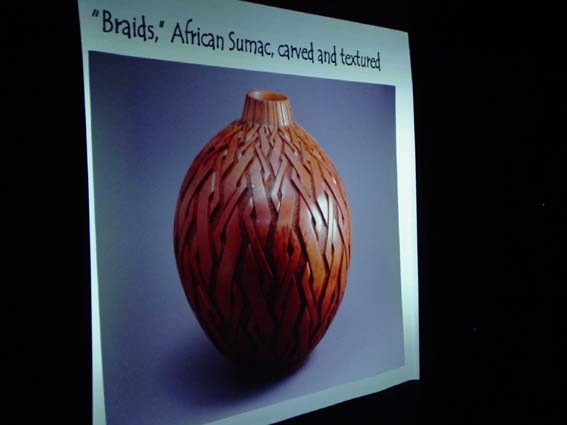 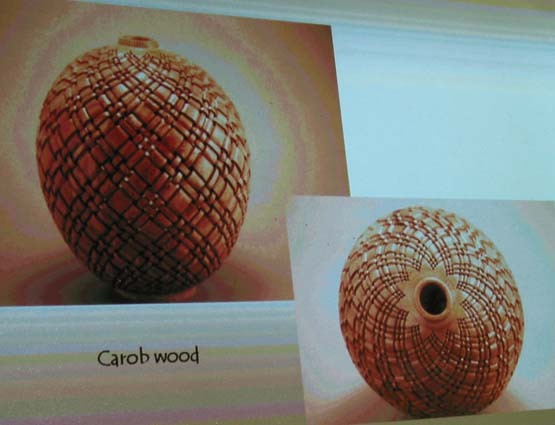 The pattern is then used to carve or pierce into the surface of a hollow form. 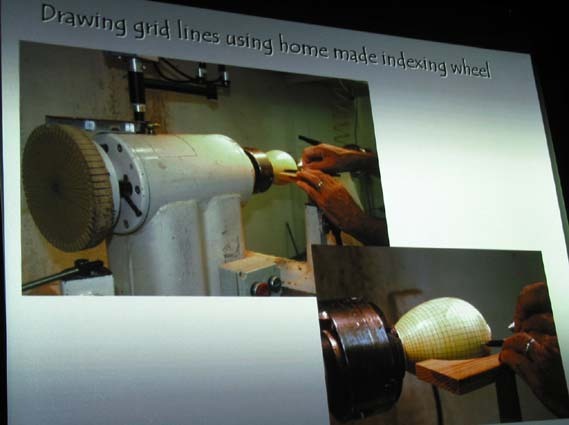 This same grid system can be used for any bowl or other single-axis form on a lathe. Paul makes a disk from a consistent material such as MDF and mounts it on a faceplate. 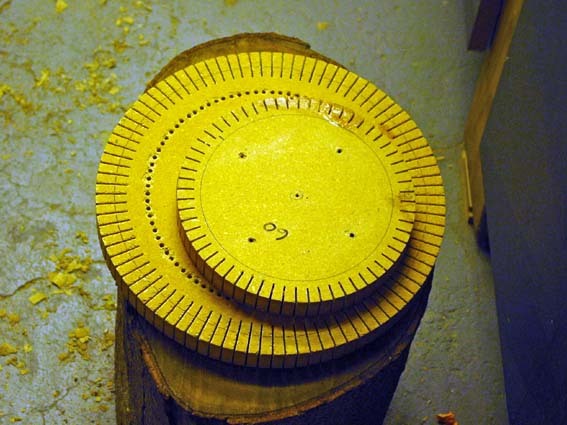 This disk becomes an indexing wheel to be mounted on the outboard end of the lathe. 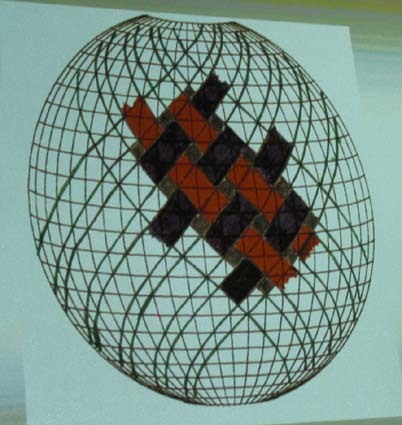 The diameter of the disk is determined by the number of divisions desired in the grid. 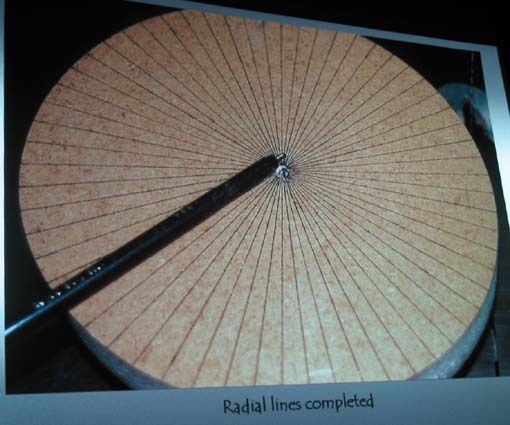 Paul uses a metric cloth tape measure (1 mm makes a nice sized division on the wheel) and divides the number of divisions in the grid by 3 to give a metric diameter for the wheel that is a little oversize. Then he turns the wheel down until the circumference has the desired number of divisions as measured with the tape. 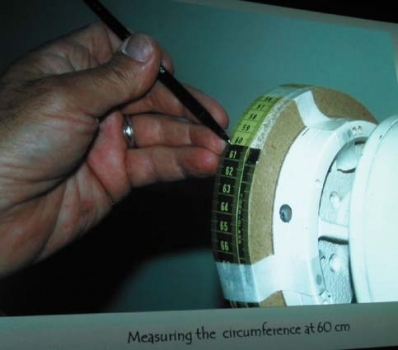 The next step is to transfer the divisions ontape to the wheel and to cut a notch in the wheel for each division about a quarter of an inch deep. Paul builds a knife-like arm that mounts to the head of the lathe and presto he has an indexing wheel with as many divisions as needed. 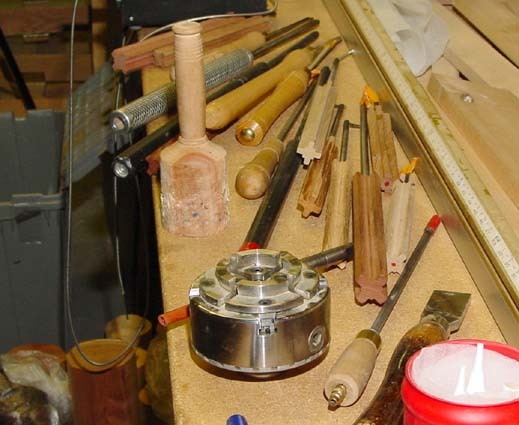 To lay out the grid he builds a tool rest like platform that is on the end of a 1” dowel (the size of the tool rest post on his lathe). The flat platform has a curved shape to roughly match the shape of the piece on the lathe. He uses a pencil to mark the longitudinal lines of the grid with the platform as a guide. The transverse(latitude) lines on the grid are laid out by measuring the distance between the longitudinal lines and using this distance to make a grid with square boxes. 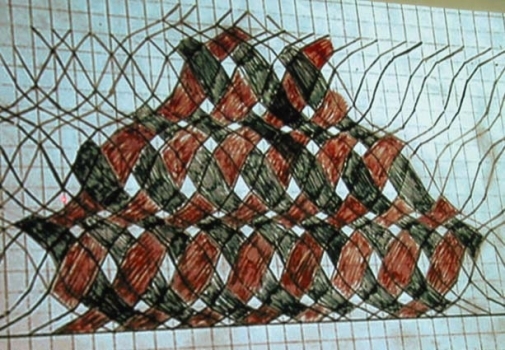 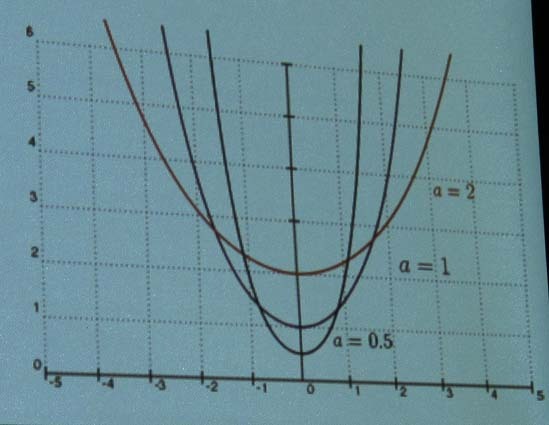 To design a spiral pattern, diagonal lines are laid out in the boxes from one corner to the next. 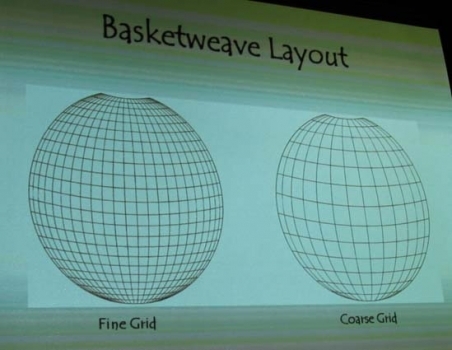 When laying out a basket weave pattern it is important to remember that you need the correct number of divisions so that the pattern works out. Paul also stressed the importance of marking the pattern beforehand so that you don’t make a mistake in the over and under carving sequence. 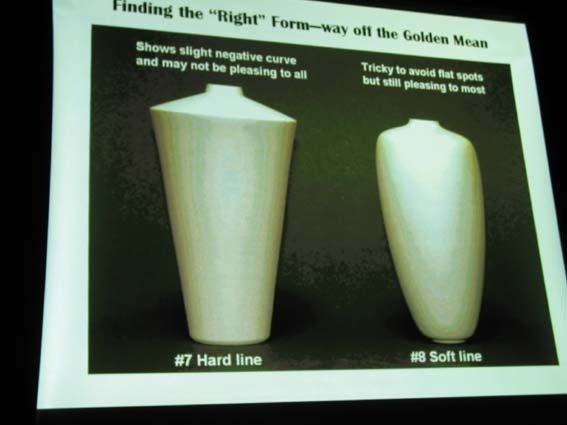 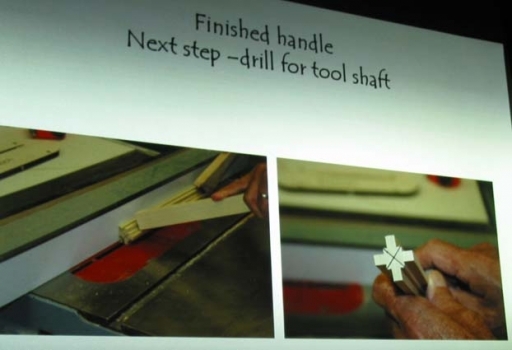 Paul explained his technique for maintaining a consistent wall thickness in a hollow form that is to be carved and pierced. 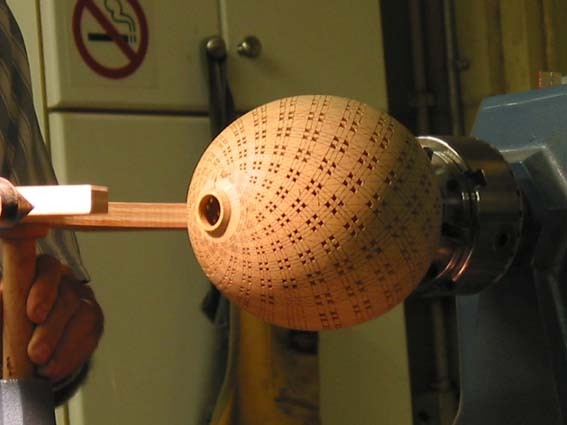 He drills small holes where the pattern will be pierced or carved through to a specified depth (using a depth stop on the drill bit). 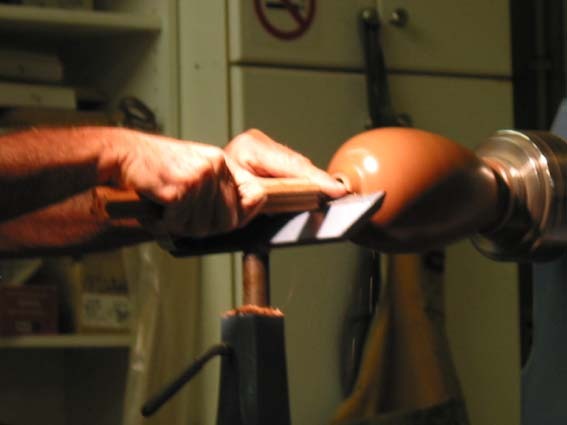 This is done when the form is rough turned. 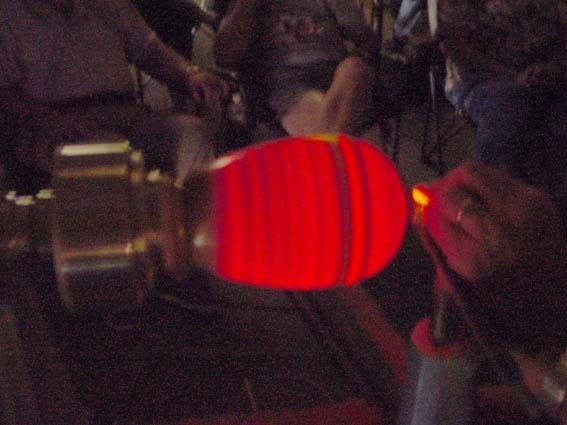 Then using his internal light he finish-turns the inside of the form until he can see the light through the predrilled holes. 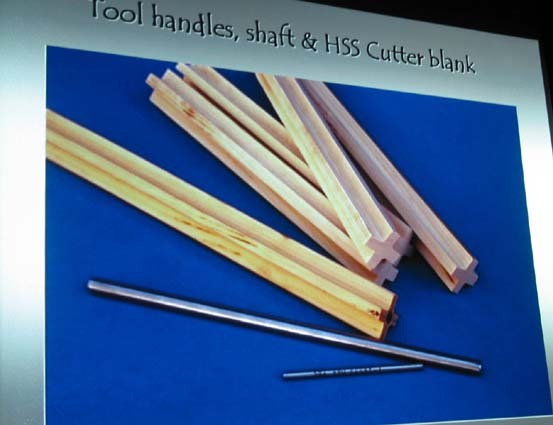 This allows a wall thickness that is thicker than usual to facilitate the carving and/or piercing. 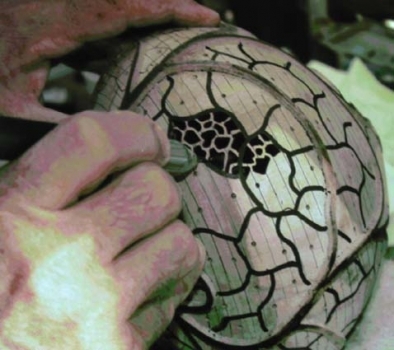 Paul also demonstrated his technique for making incised leaf patterns using a wood-burning tool. He explained his strategy for designing piercing patterns on a thin flat board to provide samples for making decisions on future projects. 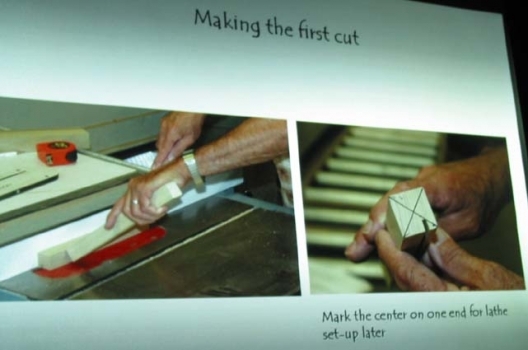 He planes the sample board down to about 1/8” and glues on a piece of grid paper to lay out the design prior to piercing the board. 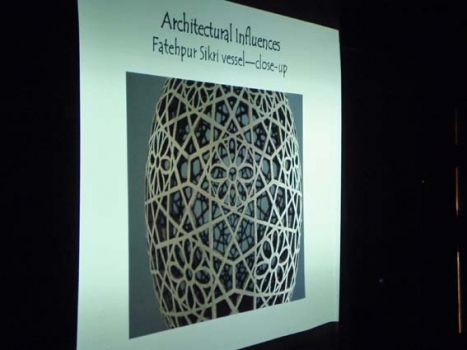 Paul talked about designing piercing patterns by laying out a flower design and piercing it. 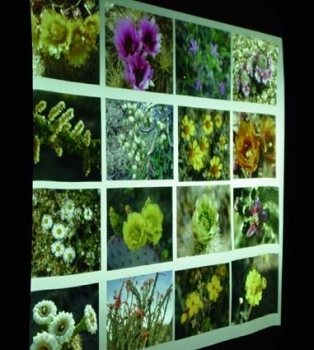 Then he lays out a random piercing pattern between the flowers and pierces that to fill in the spaces. 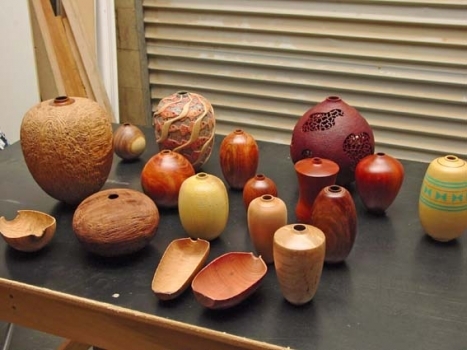 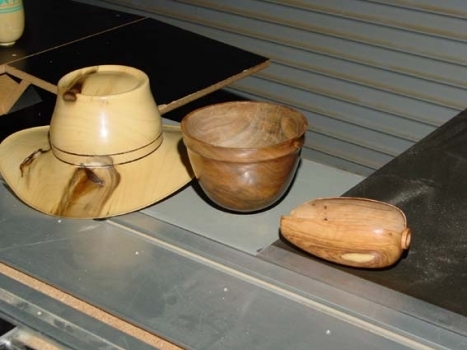 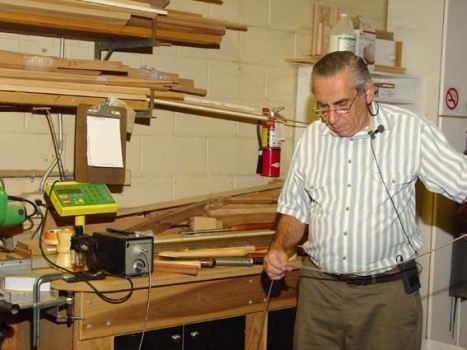 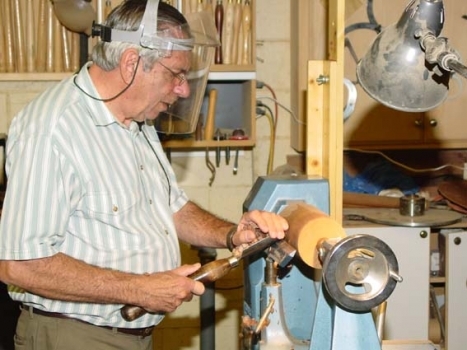 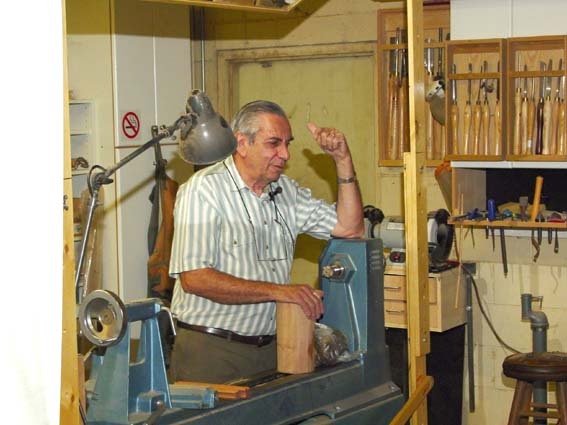 Paul uses many homemade tools for his turnings. 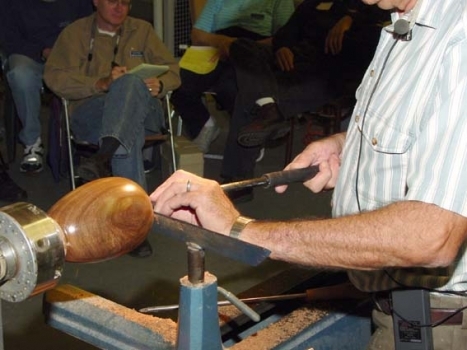 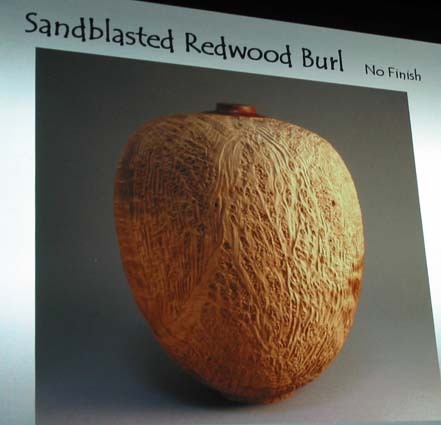 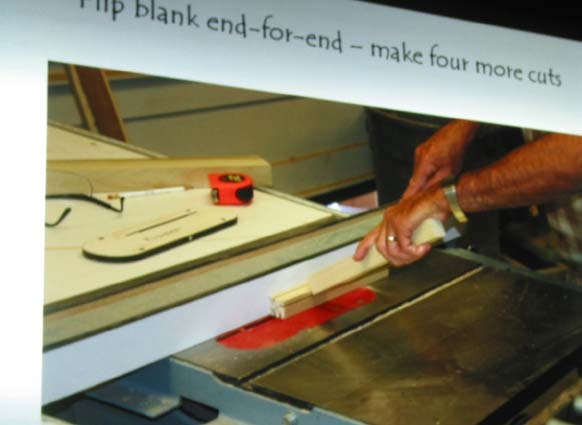 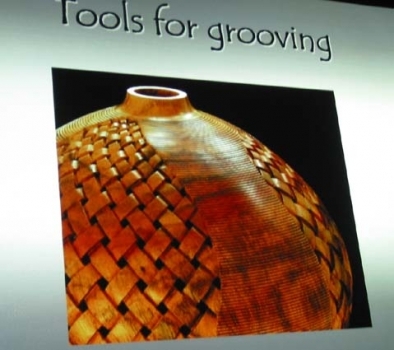 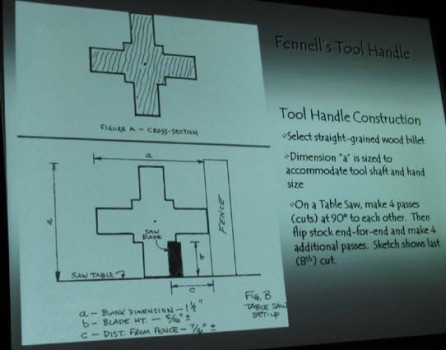 He demonstrated the tool he makes for decorative grooving on the outside of his hollow forms. 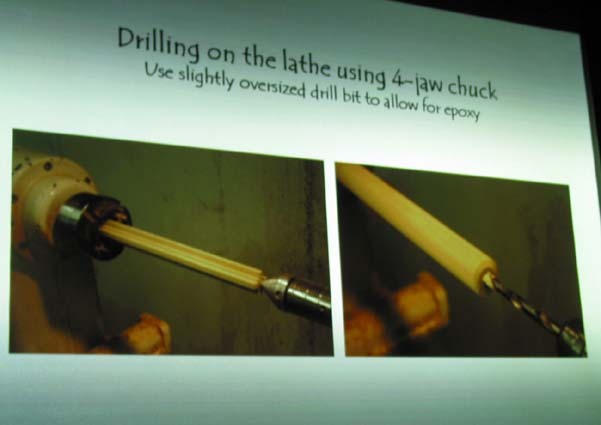 The grooving tool is made by grindingdown a hole-threading tap so that four or five teeth remain and these teeth are glued onto a shank with CA glue. 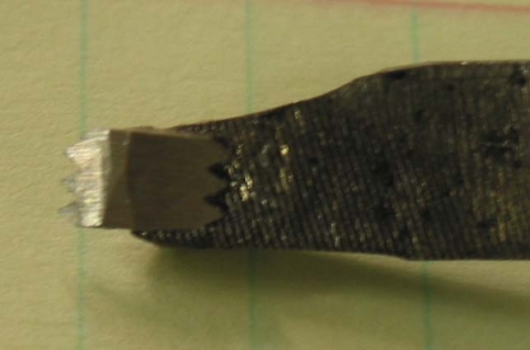 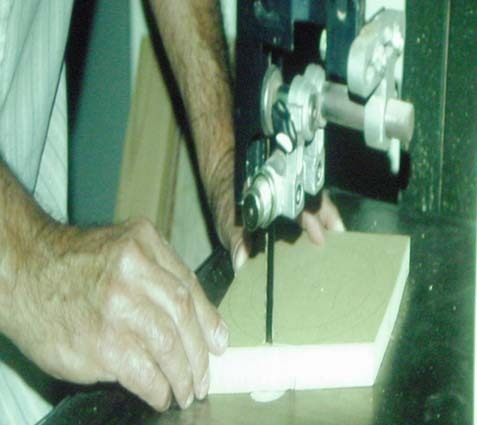 This tool is used to cut a series of grooves with the last tooth on the cutter used to index the next set of grooves. 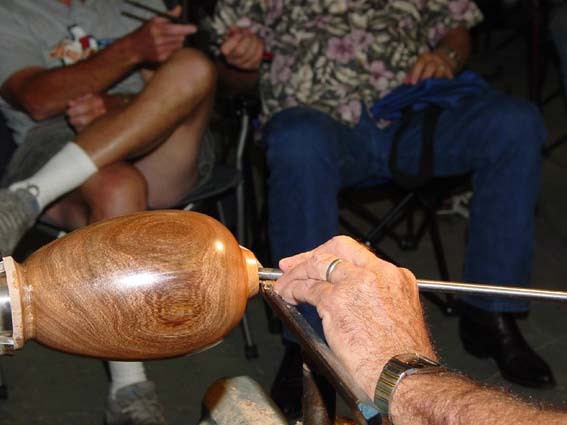 The grooves are cut at a slow speed on the lathe and then redefined with a point tool. 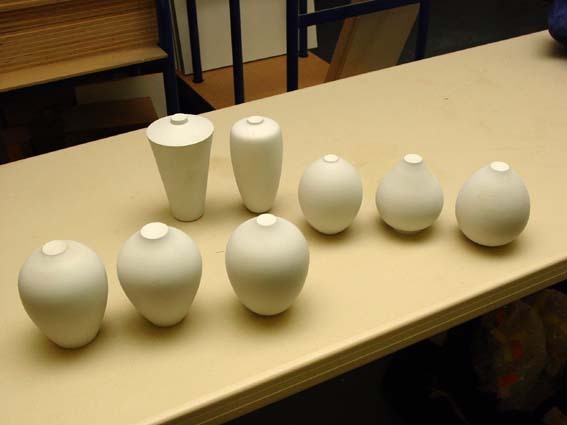 The result is a very clean, consistent decoration.